Will anyone be surprised to hear that I just got a few new cookbooks? No? It’s like you guys know me! So yes, I got some new cookbooks. Wheee! One of them, Ovenly, is from a bakery known for interesting and unique combinations of flavours. And when I first flipped through the pages of this book, this particular recipe really jumped out at me. Bourbon? Oh yes please. Chocolate chips? YUM. Tarragon? Uh… what? I really wasn’t sure how this cookie would turn out. But I was intrigued, and less than a week after I got the book, I was shopping for tarragon. And apparently I saw “tarragon” in the ingredients list and stopped reading, because I didn’t even realize until I started prepping ingredients that this cookie is made with browned butter too. Oh mama. I had high hopes for this cookie. Spoiler alert – it delivered. 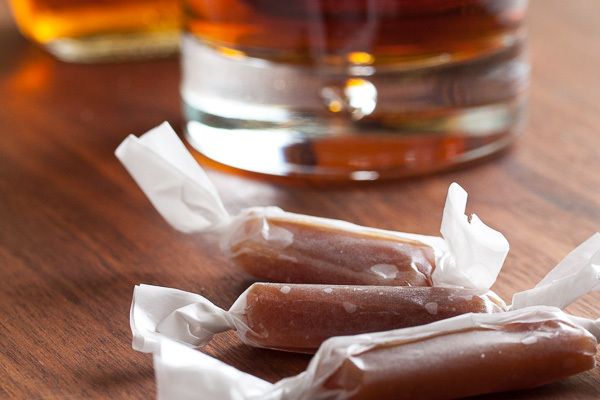 And if you’re worried about the bourbon in these, don’t. 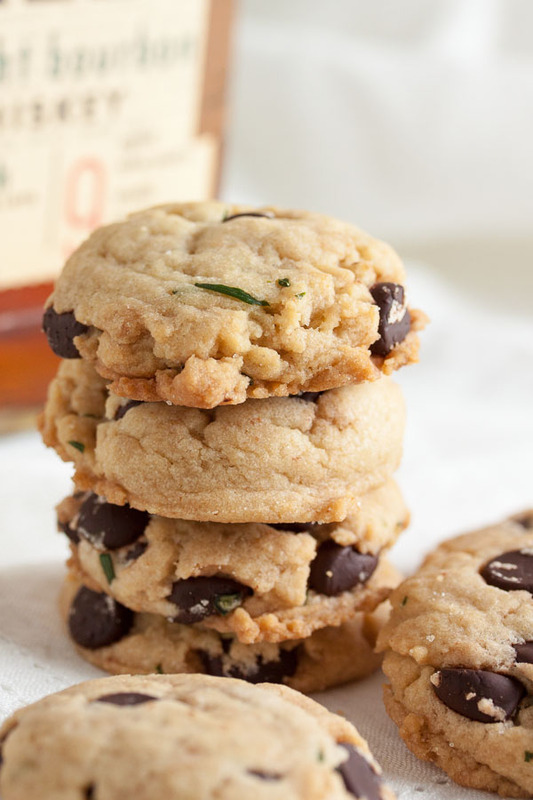 You won’t get drunk off this cookie. 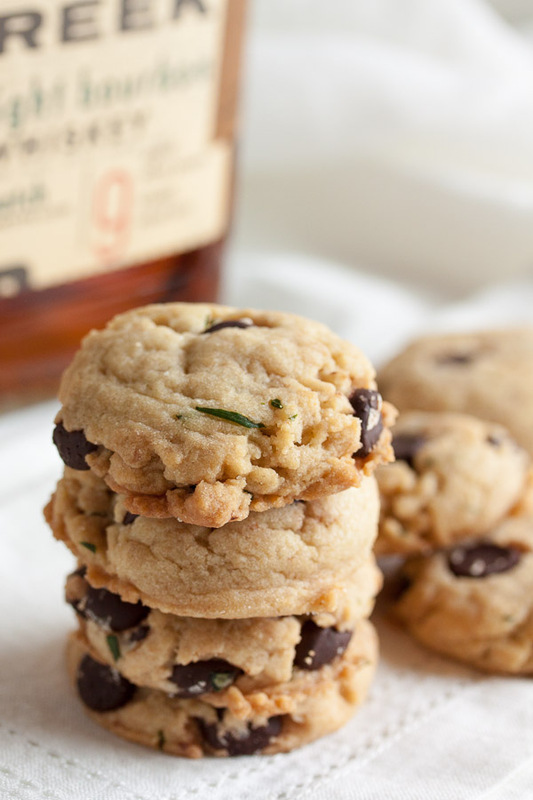 It works out to less than 1/4 teaspoon of bourbon per cookie. 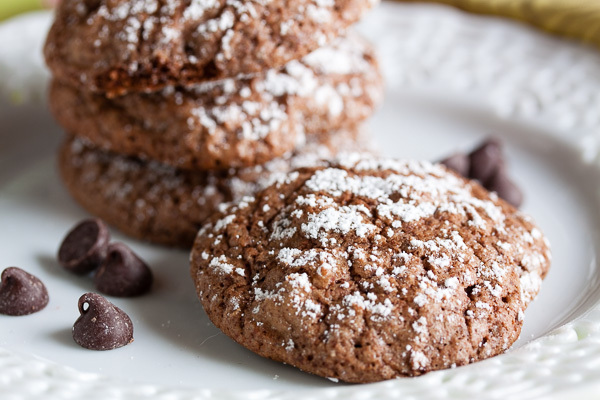 The recipe says it’s okay to use a cheaper bourbon for these cookies – once it’s combined with the other ingredients and baked, you don’t notice the nuances of a good bourbon. I don’t have a lot of different varieties of bourbon in my cupboard though (I have 2), so I sacrificed a bit of my Knob Creek for these. Not really much of a sacrifice, though, since the end result was totally worth it. Do you mind if I have a bit of a rant? Like the day after I made these, I saw a post from another blogger pop up in my FB feed for some bourbon chocolate chip cookies. What a coincidence! We must have both gotten the same book! So I clicked through to read what she thought. Well, the recipe was modified slightly, but based on some specific ingredient amounts it was obviously based on the same recipe. And she took full credit as the recipe developer. She actually used that term. That? That leaves a poor taste in my mouth. And sadly, this is a fairly well-known blogger. I know that legally as long as you change three ingredients, you don’t have to give credit to the source. But what’s the point? That’s just dishonest. I’ve unfollowed that particular blogger. I promise you all, I will always give credit to recipe authors, no matter how many tweaks I’ve made. Okay. Sorry. I just had to get that out of my system. Now go bake some cookies! 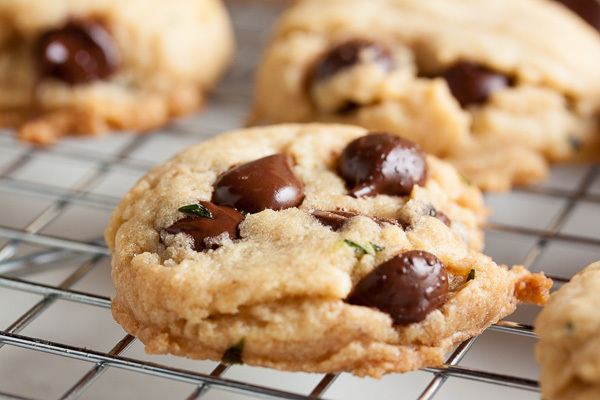 Adapted from "Bourbon Chocolate Chip Cookies with Tarragon" from Ovenly by Agatha Kaluga and Erin Patinkin. The recipe said it would make 24 cookies when the dough is formed into 1-inch balls, but I got 54 cookies using my usual tablespoon-sized scoop. Melt the butter over medium-low heat in a small, heavy saucepan. Continue to cook at medium-low. The butter will first crackle and foam, and then the foam will die down. At this point, the milk solids will begin to brown. Continue to cook, stirring constantly, until the butter is golden brown and has a nutty smell. Trust your senses. You may be tempted to turn up the heat to speed up the process, but don't – butter can burn quickly over higher heat. 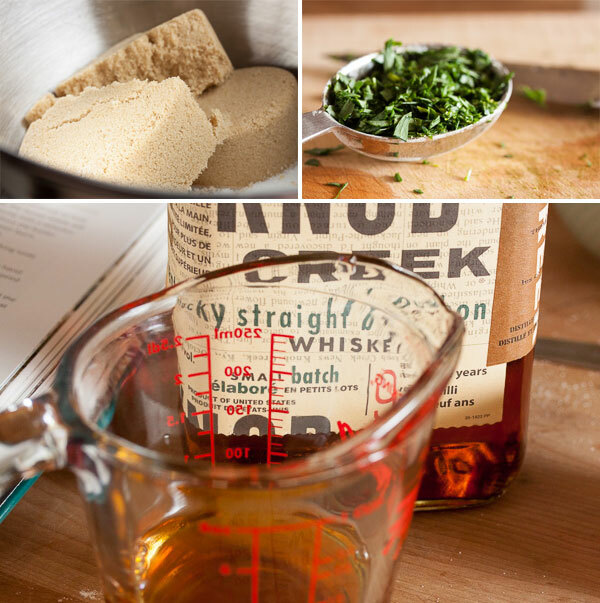 If you've never made browned butter before, check out the visual tutorial over at The Kitchn. In the bowl of a stand mixer fitted with the paddle attachment, beat the cooled butter and sugars together on medium speed until well-combined, about a minute. Scrape down the sides of the bowl and add the eggs, beating well. Add the bourbon and the vanilla, and beat again to incorporate. Turn the mixer down to low and add the dry ingredients, mixing until just barely combined. 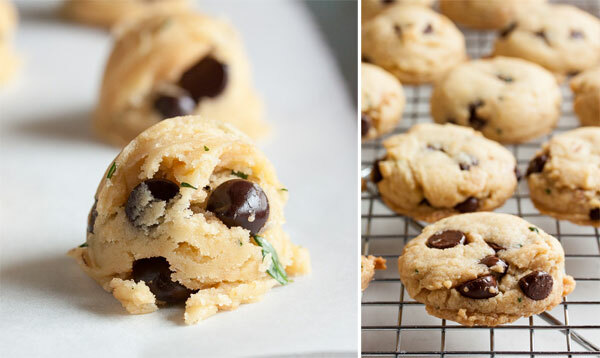 Remove from the mixer and add in the chocolate chips and tarragon, either with a spatula or by hand. I prefer to knead inclusions in by hand to ensure they're distributed evenly. Cover the dough with plastic wrap and refrigerate for about 30 minutes. Either by forming the dough into small balls or using a small cookie dough scoop, portion the dough onto the baking sheets about 2 inches apart to allow for spreading. Okay I have to admit I did a bit of a double take when I saw the green flecks, but I’m coming around to the idea now. 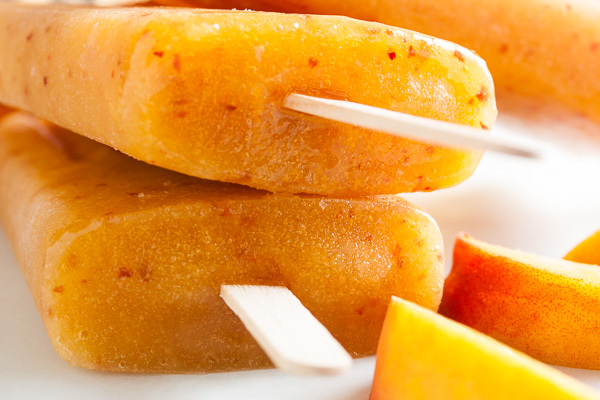 What a unique combination of ingredients – thanks for sharing the recipe with us! I’ll have to check out that cookbook when I get a chance. I don’t have (or really care for) tarragon. What would be a good substitute or can I just leave it out completely without ruining the cookies?